MESA, Ariz. (AP) — Yu Darvish felt pressure after signing a $126 million, six-year contract with the Chicago Cubs. "At the time I didn't say anything about that, but I was thinking I should do something for the Cubs. I should win 20 games," he said Wednesday. "This year I want to be myself. I am feeling less pressure." Darvish went 1-3 with 4.95 ERA in eight starts during 2018, the last coming on May 20. He was sidelined by triceps and elbow injuries, and his season ended in August when an MRI showed a stress reaction in his arm after one inning of a rehab start. The 32-year-old right-hander spoke in English, a sign he is feeling more comfortable, after his first bullpen session of spring training. "I am feeling I am family," he said. "I feel good right now." Darvish came to the major leagues from Japan before the 2012 season and became a four-time All-Star with the Texas Rangers. He was traded to the Los Angeles Dodgers in July 2017 and struggled in the World Series, losing Games 3 and 7 against Houston. Cubs manager Joe Maddon said the fact that Darvish opened up about last year's struggles is a sign of him maturing. 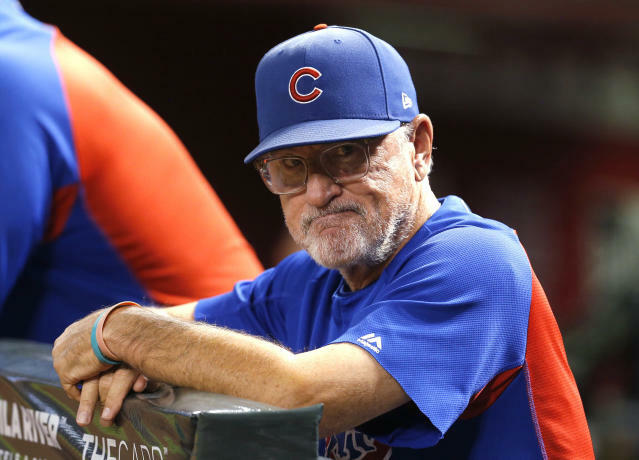 "It is always impressive when somebody exposes himself, especially on this level," Maddon said. "It is a part of moving forward. Give him credit. I was getting to know about him last year, so I didn't know all of that about him." Fellow starter Jon Lester added making the move to another organization can be difficult. After spending his first 8 1/2 years with Boston, Lester was traded to Oakland and then joined the Cubs. "That first year is a little tough," Lester said. "Everybody handles it a different way. He's unique coming from Japan and Texas and now here and going through with what he went through with the Dodgers. He had a lot on his plate and having to try and pitch through some things he wasn't comfortable pitching through. You want to make a good impression with everybody, and that includes the fans. I'm sure it was tough on him." Darvish reported at 230 pounds, down 10 from last year. He said he spent more time in a gym and ate better. "He looks huge, like jacked," reliever Steve Cishek said. "It's encouraging to see. Obviously, he was disappointed he couldn't be out on the field last year. As a competitor you want to see your teammates fight through that stuff." A healthy Darvish would mean more depth for an already strong rotation that helped the Cubs win 95 games last season. "If you slide him in there that makes our rotation that much deeper, which you need throughout the season," Lester said. "It's a huge boost for us if we get the Darvish we all know he can be. Hopefully everything is behind him as far as his arm. I'm sure it is a piece of mind for him to go out and worry just about pitching."